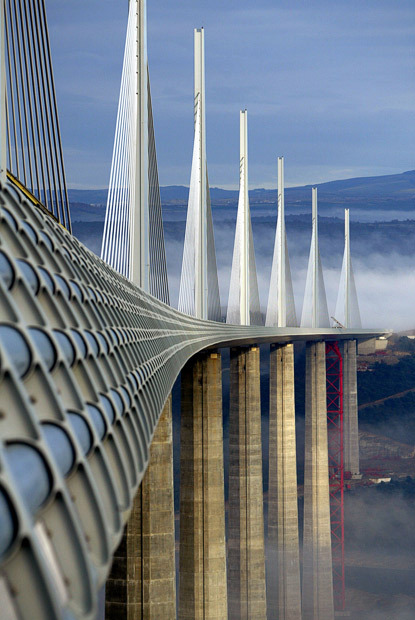 The Millau Viaduct is a cable-stayed bridge that spans the valley of the river Tarn near Millau in southern France. Designed by the French structural engineer Michel Virlogeux and British architect Norman Foster, it is the tallest bridge in the world with one mast's summit at 343.0 metres (1,125 ft) above the base of the structure. It is the 12th highest bridge deck in the world, being 270 metres (890 ft) between the road deck and the ground below. Millau Viaduct is part of the A75-A71 autoroute axis from Paris to Montpellier. Construction cost was approximately €400 million. It was formally dedicated on 14 December 2004, inaugurated on the 15th, and opened to traffic on the 16th. The bridge has been consistently ranked as one of the great engineering achievements of all time. The bridge received the 2006 International Association for Bridge and Structural Engineering Outstanding Structure Award.